There are many reasons to believe Oregon will defeat the Florida State Seminoles this Thursday in the Rose Bowl, but how premature would it be to predict the game’s result based on each team’s conference records this Bowl season? Well if I did it certainly wouldn’t be pretty, because among the 11 conferences with teams playing in College Bowl games, the Pac 12 remains unbeaten while a bulk of the ACC has struggled mightily. (22) Utah 45 – Colorado State 10 in the Royal Purple Las Vegas Bowl. (15) Arizona State 36 – Duke 31 in the Hyundai Sun Bowl. (24) USC 45 – Nebraska 42 in the National University Holiday Bowl. Rutgers 40 – North Carolina 21 in the Quick Lane Bowl. North Carolina State 34 – UCF 27 in the Bitcoin St. Petersburg Bowl. Virginia Tech 33 – Cincinnati 17 in the Military Bowl. South Carolina 24 – Miami 21 in the Duck Commander Independence Bowl. Penn State 31 – Boston College 30 in the New Era Pinstripe Bowl. (17) Clemson 40 – Oklahoma 6 in the Russell Athletic Bowl. Now I know that all three of the Pac 12 wins were ranked teams against non-ranked teams, but all three of their opponents were ranked at one point this season. Plus the true testament to this claim is based on the ACC’s inability to win winnable games and Florida State’s performance against those teams that wound up losing this post season. Florida State barely held on to beat Georgia Tech in the ACC Championship game. Of the four teams that have lost so far in the ACC, Florida State only played Miami and Boston College. Both of those teams lost their bowl game to teams that entered with a 6-6 record. So what’s hard to believe is that Florida State struggled against both of those teams. Against Miami they were down by 13 at halftime, and against BC they were tied in the fourth quarter. They went on to win both of those games by a total of 7 points. Yeah, that’s just how impressive their ACC wins are this year. Furthermore, the other two teams that lost in bowls games so far were Duke and North Carolina. Both of those teams beat the Coastal Division champion, Georgia Tech, and if you forgot, Florida State only squeaked out a two-point win versus the Yellow Jackets in the ACC championship. Meanwhile, although USC and Arizona State didn’t have convincing wins, they did win. To win a bowl game is never easy, and that’s what makes the Pac-12’s performance bittersweet. The Pac-12 teams found ways to win and have avoided all possibilities of upsets so far, unlike a few of the ACC teams. 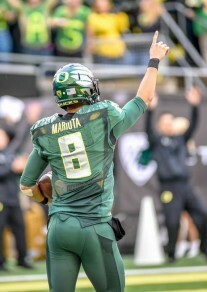 Heisman winner, Marcus Mariota, will try to help the Oregon Ducks get past Florida State in the Rose Bowl. A win for the Ducks would help the Pac-12 bowl record and worsen the ACC record. One final statistic to keep in mind is the margin of victory. Compared to last years 38.8 points per game, Florida State’s margin of victory has dropped down to 10.7. It’s evident how dominant the Seminoles were last year against their ACC opponents, but it’s also clear how much they struggled against them this year. Oregon, on the other hand, has an identical margin of victory from last year with 21.8, which ranks fifth in the nation. The overall argument remains that if conference play leading up to this postseason was the only indication of what to expect from the upcoming Rose Bowl matchup, most would expect Oregon to dominate. This argument may seem illegitimate because Florida State hasn’t lost once in its last 29 games, and it’s hard to compare its talent to the rest of the ACC. But just for the heck of it, why not think of another reason why the Ducks will win on Thursday?